When Eataly, the giant Italian food and wine emporium and experience, opened in New York last year it got tons of buzz. But for the true and bigger Eataly experience, I recommend you visit the very first Eataly which opend in Turin in 2007. 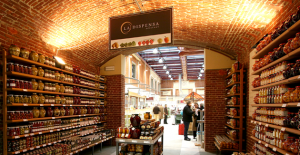 To that end, many of the 40,000 carefully selected food items (most locally sourced from 900 Italian producers but other from international sources as well) are labeled with placards describing their provenance and attributes. There’s a computer center, a library, a small museum and rooms for tasting seminars and cooking classes. For travelers, Eataly is a fantastic and affordable destination for a meal or a snack. On the first floor there are eight main sections each devoted to a specific food and overseen by an expert: butcher; cured meats; bakery; pizzeria; pasta kitchen; produce area; fishmonger; cheese section. There’s a dining area in each section and if you’re feeling ambitious you can move from one to another for a multi-course meal. Nearby to finish up your meal with something sweet, you’ll find an espresso bar, chocolate section and gelateria. But wait, there’s more. Downstairs there’s a more formal restaurant, GuidoperEataly, run by a famous restaurateur from nearby Alba. The basement also houses the wine cellar and a brew pub where you can pull up a stool and taste a tantalizing selection of beers. At Eataly, there’s truly something for everyone. Expect to spend a few hours there; the aesthetics alone worth experiencing but bring an empty stomach along too.